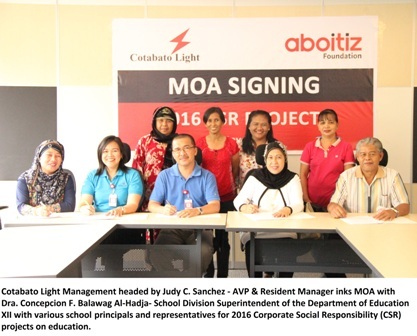 A 1-M budget for Corporate Social Responsibility Project of Cotabato Light & Power Company is readily available to various public schools for this year. A one-time signing of Memorandum of Agreement between Department of Education XII – SDS, recipient school principals and Cotabato Light's Management, was held on May 20, 2016 in the latter's office. The CSR Projects for the year includes the assistance in three (3) public elementary schools. The annual Brigada Eskwela in Lugay-Lugay, Concreting of Three Classroom's flooring in Datu Siang and Kitchen Enhancement Project for Special Children in Cotabato City Central Pilot School. The biggest chunk of the budget amounting to almost Php 600,000 goes to Canizares National High School for the Project E-Lab. This Electrical Laboratory is in support to TechVoc School which will enable students to learn the basics in Electrical Installation and Maintenance (EIM). Through this, we are confident that we would be able to produce competent accredited electricians after gaining TESDA's NC2. The Tiered Scholarship Program to students continue until they graduate in Senior Highschool. 35 students will benefit from this program. They will receive 4,000 – 7,000 each depending on their current grade level. Ms. Anna Lea Lee L. Nataño, Human Resource/RD Head mentioned that this is company's way of giving back to the community. “We are happy that we have become an instrument to give a better future for this children”. Cotabato Light's CSR Team's first project for the year will be the Brigada Eskwela which will commence from May 30 – June 4.